The world of Composable jewellery is richer than ever and it goes beyond bracelets. In fact, the Composable Collection also includes watches – functional and personalisable accessories for both men and women. The watch is a classic accessory that’s always fashionable and can be worn on both casual and formal occasions requiring a certain level of elegance. But those from the Composable Collection aren’t your basic watch with a stainless steel wristband. Their uniqueness comes from the fact that they can be customised thanks to the iconic Composable Classic or Big Links. So the Composable watch is an instantly distinctive must-have, expressing your personality and sharing the most important moments in your life ever day. Personalise it and create a one-of-a-kind accessory: it’s not every day you come across a watch decorated with charms and gemstones as if it were actually a precious bracelet, do you? Personalisable Composable watches come in several different models and with many different wristband finishings and details. The round dial characterises most of the watches in the collection: a classy choice whether it’s worn by a man or a woman. To meet everyone’s needs and tastes, the round clock face is available in different finishings: classic black, blue and grey, commonly chosen for men’s accessories, and available in pink. We also offer elegant white or grey round dials decorated with a floral motif: a chic choice just for her. Every Composable watch can become one of a kind. The watchstrap is, in fact, compatible with Composable Links from the Classic or Big lines: choose from among tons of Links and compose your watch based on your tastes, or on the tastes of the person you’re giving it to. 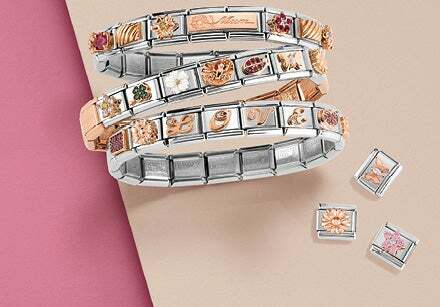 You can create truly glamorous jewellery by personalising the watchstrap with precious Links adorned with coloured stones, sparkling gemstones and pendant charms. 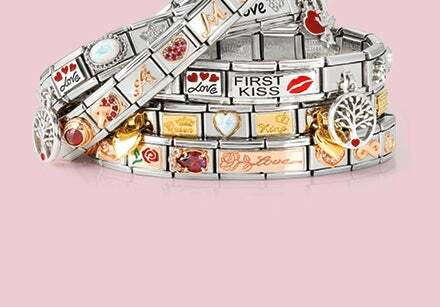 Build a customised bracelet that’s all about you using Links with gold letters to write a message, a word, or a motto that portrays your personality. Transform your Composable watch into a travel diary with Links dedicated to cities and vacations spots all over the world. Discover all the Composable Links and personalise your watch! Perfect for each occasion and moment of the day, the Composable watch is an accessory for everyone, to be worn by men, woman and children. Just choose the right base and personalise the watchstrap with the perfect Links. For women who love chic, eccentric jewellery, the perfect watch has a clock face and wristband entirely in gold plating. This accessory will not go unnoticed. Discover the Composable watches and all the ways they can be personalised according to who’s wearing them!